In the previous article (http://ponnadi.blogspot.in/2013/07/anthimopaya-nishtai-15.html), we observed the glories of the prasAdham and srIpAdha thIrtham of AchAryas and bhAgavathas. 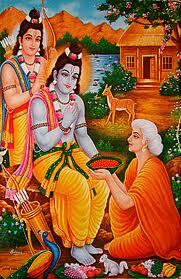 We will continue with the next section which discusses the glories of srIvaishNavas irrespective of their birth. 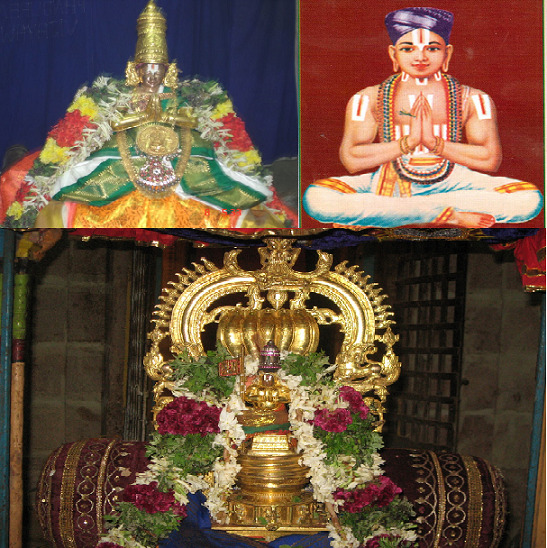 azhagiya maNavALa perumAL nAyanAr who is the divine younger brother of piLLai lOkAchAryar, blesses with deep and beautiful meanings in AchArya hrudhayam. In chUrNikai 85, he first highlights that, the ones who understand the following incidents only will truly know the nature of a srIvaishNava's birth - high or low (Translator's note: the following section clearly demonstrates that ones greatness is not judged by birth but by their devotion to bhagavAn and bhAgavathas. In this day and age, where everything is appreciated purely based on bodily conception, our pUrvAchAryas literature and their life are ideal examples for us to understand and follow and live a life which rises above the bodily conception. The beauty is - our pUrvAchAryas were parama Asthikas (strictly following varNAsrama dharmam) who knew how to respect bhAgavathas of all varNams based on their devotion). 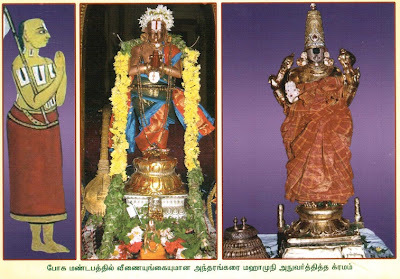 mlEchchanum bhakthanAnAl chathurvEdhigaL anuvarththikka aRivukoduththuk kuladheyvaththodokka pUjai koNdu pAvana thIrththaprasAdhanAm engiRa thirumugappadiyum (ம்லேச்சனும் பக்தனானால் சதுர்வேதிகள் அனுவர்த்திக்க அறிவுகொடுத்துக் குலதெய்வத்தொடொக்க பூஜை கொண்டு பாவன தீர்த்தப்ரஸாதனாம் என்கிற திருமுகப்படியும்) - emperumAn himself says that eight qualities are expected in his real bhakthas and even if a mlEchan (one who is not part of varNAsrama dharmam) has these eight qualities - expert in 4 vEdhas, accept him and treat him at least equal to emperumAn himself (infact we should respect/treat them higher than emperumAn) - i.e., share bhagavadh vishayam with him, worship him, accept his sri pAdha thIrtham and sEsha prasAdham since those will purify them. The eight qualities are: 1) unconditional love for bhakthas of emperumAn, 2) enjoying (others) worship of emperumAn, 3) worshipping emperumAn him/herself, 4) being without any pride, 5) having attachment in listening about emperumAn, 6) having bodily changes (like goose bumps, etc) when hearing/thinking/speaking about emperumAn, 7) always thinking about emperumAn, 8) not asking material benefits in return for worshipping emperumAn. viswAmithra - vishNuchiththa - thuLasIbruthyarOdE uLkalanthu thozhukulamAnavan nilaiyAr pAdalAlE brAhmaNa vELvikkuRai mudiththamaiyum (விச்வாமித்ர - விஷ்ணுசித்த - துளஸீப்ருத்யரோடே உள்கலந்து தொழுகுலமானவன் நிலையார் பாடலாலே ப்ராஹ்மண வேள்விக்குறை முடித்தமையும்) - nampAduvAn (who sung kaisika rAgam for malai nambi in thirukkurungudi and was thus compared to viswAmithra rishi, periyAzhwAr and thoNdaradipodi AzhwAr who all sung thiruppaLLiyezhuchi (awakening song) for emperumAn) who is not born in high birth, removed the curse of the brahma rakshas (a brAhmana due to his improper chanting of mantrams during a yAgam became a rAkshasa) by the fruits of his songs. kIzhmagan thalaimaganukku samasakAvAi, thambikku mun piRanthu vElum villum koNdu pin piRanthArai sOdhiththu thamaiyOn iLaiyOn sathbhAvam sollumpadi EkakulamAnamaiyum (கீழ்மகன் தலைமகனுக்கு ஸமஸகாவாய், தம்பிக்கு முன் பிறந்து வேலும் வில்லும் கொண்டு பின் பிறந்தாரை சோதித்து தமையோன் இளையோன் ஸத்பாவம் சொல்லும்படி ஏககுலமானமையும்) - guhan who was born in hunter family but became a dear friend and brother of perumAL (srI rAma), doubted iLaya perumAL (lakshmaNa) when perumAL was sleeping in the night. So guha kept awake and watched lakshmaNa all night. 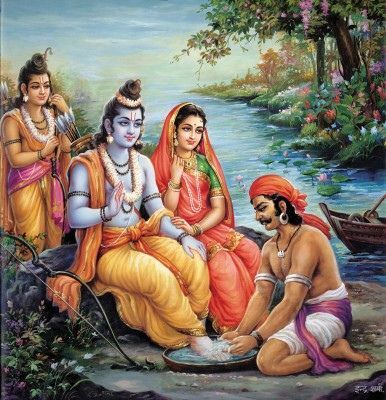 Also, when bharatha (who is well aware of srI rAma/lakshmaNa's qualities) comes to meet guha, guha explains the greatness of lakshmaNa to bharatha as if he does not know about it - but bharatha hearing this feels so happy to hear this from guha - thus all 5 (srI rAma, guha, bharatha, lakshmaNa, shathrugna) becoming a single family. orupiRaviyilE irupiRaviyAnAriruvarkku dharmasUnuswAmigaL agrapUjai koduththamaiyum (ஒருபிறவியிலே இருபிறவியானாரிருவர்க்கு தர்மஸூனுஸ்வாமிகள் அக்ரபூஜை கொடுத்தமையும்) - yudhishtra giving the first mariyAdhai to kannan emperumAn (who is not born in a brAhmana family), perumbuliyUr adigaL giving the first mariyAdhai to thirumazhisai AzhwAr who was raised by a wood cutter - both krishNan and thiruamzhisai AzhwAr had two births in the same life - krishNan was born to kshathriya parents and moved to .vaishya family and AzhwAr was born to brAhmaNa parents and moved to wood cutter family. aivaril nAlvaril mUvaril muRpattavargaL sandhEhiyAmal sahajarOdE purOtAsamAgach cheytha puthra kruthyamum (ஐவரில் நால்வரில் மூவரில் முற்பட்டவர்கள் ஸந்தேஹியாமல் ஸஹஜரோடே புரோடாசமாகச் செய்த புத்ர க்ருத்யமும்) -yudhishtra the leader among five performing charama kainkaryam for srI vidhura (born of a servant-maid), srI rAma the leader among four performing charama kainkaryam for jatAyu (bird) and periya nambi the leader among three nambis (periya nambi, thirukkOshtiyUr nambi, thirumalai nambi) performing charama kainkaryam for mARanEri nambi. aRivArkkirE janma uthkarsha apakarshangaL therivathu (அறிவார்க்கிரே ஜந்ம உத்கர்ஷ அபகர்ஷங்கள் தெரிவது ) - only those who know and understand the above incidents will understand the real high and low births. In the beautiful vyAkyAnam, mAmunigaL concludes that nAyanAr has explained this principle in the most effective way so that even dumb-headed persons can understand the glories of bhAgavathas (irrespective of their birth) easily. Any of the above without devotion to emperumAn are like beautiful ornaments for a widow which are of no use since she does not have mangaLasUthram (without which she cannot use all the ornaments). Similarly, mere varNam, Asramam, gyAnam and words (that are not drenched in devotion for bhagavAn) fascinates the ignorants, but learned scholars will simply ignore them and will not attach any value to those. 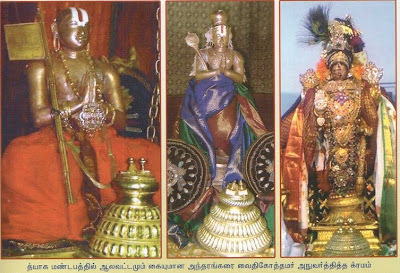 In the next section, several sUthrams from piLLai lOkAchAryar's srIvachana bhUshaNa dhivya sAsthram is quoted, where the glories of srIvaishNavas irrespective of their birth is explained. 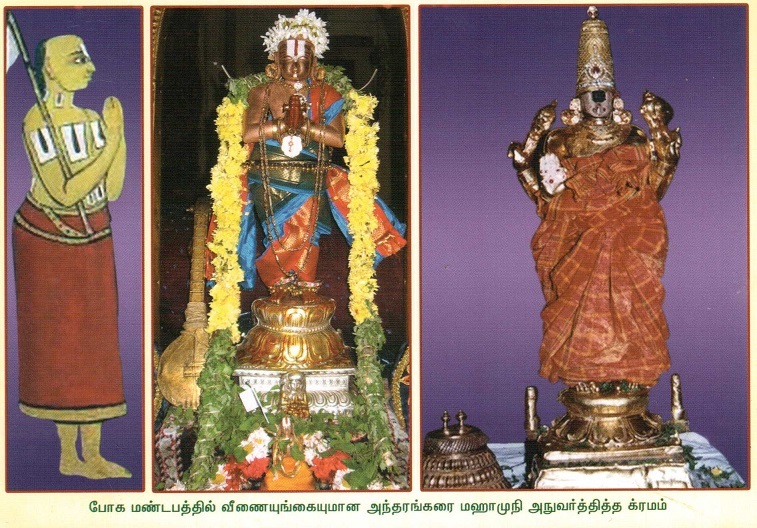 In the sUthrams leading upto sUthram 212, the glories of being a vaishNava is highlighted. As said in jithanthE sthOthram 1.9 "sarIrE cha", while explaining the various things one have to fear for, the body which provides the eligiblity to perform our varNAsrama dharmam is highlighted as one of the primary causes for fear. sUthram 213 - athukku svarUpa prApthamAna naichyam bAvikka vENum (அதுக்கு ஸ்வரூப ப்ராப்தமான நைச்யம் பாவிக்க வேணும்) - For people of such high birth, they have to practice humility which is natural to the jIvAthmA, by looking at others who are properly practising the same. sUthram 217 - svapachOpi mahIpAla (ச்வபசோபி மஹீபால) - As said in this slOkam by bhagavAn himself, even a chaNdAla, if he is my bhaktha, know his as greater than a twice-born. On the other hand, one who is not my bhaktha, even if is a sannyAsi he is lower than a chaNdAla. sUthram 218 - nikrushta janmaththAl vandha dhOsham samippathu vilakshaNa sambandhaththAlE (நிக்ருஷ்ட ஜந்மத்தால் வந்த தோஷம் சமிப்பது விலக்ஷண ஸம்பந்தத்தாலே) - For the people who are born in (real) low birth which is filled with possibility of indulging in upAyAntharam, etc., their defects gets removed by establishing a relationship with srIvaishNavas who are fully free of such blemishes. sUthram 220 - janmaththukku koththaiyum athukkup parihAramum "pazhuthilA ozhugal" engiRa pAttilE aruLich cheythAr (ஜன்மத்துக்கு கொத்தையும் அதுக்குப் பரிஹாரமும் "பழுதிலா ஒழுகல்" என்கிற பாட்டிலே அருளிச் செய்தார்) - the misunderstandings based on ones birth and the remedy for such misunderstandings are explained mercifully by thoNdaradippodi AzhwAr in "pazhuthilA ozhugal" (பழுதிலா ஒழுகல் - thirumAlai 42) pAsuram. In this pAsuram, AzhwAr explains "The ones who come in uninterrupted brAhmaNa lineage and who has mastered all four vEdhas, to relieve them from their pride, etc., should worship devotees of srIman nArAyaNan who are devoid of such pride, etc., and accept/give knowledge from them to purify oneself". sUthram 222 - ivargaL pakkal sAmya budhdhiyum Adhikya budhdhiyum nadakka vENum (இவர்கள் பக்கல் ஸாம்ய புத்தியும் ஆதிக்ய புத்தியும் நடக்க வேணும்) - Such srIvaishNavas should be considered as equal and higher. sUthram 223 - athAvathu AchArya thulyarenRum samsArigaLilum thannilum Isvaranilum adhikarenRum ninaikkai (அதாவது ஆசார்ய துல்யரென்றும் ஸம்ஸாரிகளிலும் தன்னிலும் ஈச்வரனிலும் அதிகரென்றும் நினைக்கை) - To be precise, they should be considered equal (at par) with ones own AchAryan and should be considered/treated higher than samsAris (materially focussed people), ones own self and Ishwaran himself. sUthram 224 - AchArya sAmyaththukkadi AchArya vachanam (ஆசார்ய ஸாம்யத்துக்கடி ஆசார்ய வசனம்) - Considering srIvaishNavas at par with ones own AchAryan is due to the instruction of the AchAryan himself at the time of taking shelter at his lotus feet. 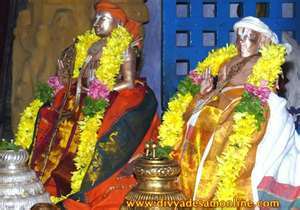 sUthram 225 - ippadi ninaiyAthozhigaiyum apachAram (இப்படி நினையாதொழிகையும் அபசாரம்) - just like analysing a srIvaishNava's birth is a great offense, not giving them due respects to srIvaishNavas (along the lines of previously stated principles) is also a great offense/mistake. sUthram 227 - kshathriyanAna visvAmithran brahmarishi AnAn (க்ஷத்ரியனான விச்வாமித்ரன் ப்ரஹ்மரிஷி ஆனான்) - visvAmithram who was born in a kshathriya family became a brahma rishi (which is only generally applicable for brAhmaNa). sUthram 228 - srIvibhIshaNanai rAvaNan kulapAmsanam enRAn; perumAL ikshvAku vamsyanAga ninaiththu vArththai aruLichcheythAr (ஸ்ரீவிபீஷணனை ராவணன் குலபாம்ஸநம் என்றான்; பெருமாள் இக்ஷ்வாகு வம்ச்யனாக நினைத்து வார்த்தை அருளிச்செய்தார்) - rAvaNan declared that srIvibhIshaNan is a traitor; srI rAman (perumAL) considered srIvibhIshaNan (who was born in rAkshasa lineage) as his own brother coming in the lineage of ikshvAku and spoke to him affectionately. sUthram 229 - periya udaiyArukku perumAL brahmamEdha samskAram paNNiyaruLinAr (பெரிய உடையாருக்கு பெருமாள் ப்ரஹ்மமேத ஸம்ஸ்காரம் பண்ணியருளினார்) - srI rAman affectionately performed charama kainkaryams (last rites) for jatAyu mahAraja (who was born as a bird) which is generally done by sons/sishyas to their father/AchArya. sUthram 230 - dharmaputhrar asarIri vAkyaththaiyum, gyAnAdhikyaththaiyum koNdu srIvidhurarai brahmamEdhaththAlE samskariththAr (தர்மபுத்ரர் அசரீரி வாக்யத்தையும், ஜ்ஞாநாதிக்யத்தையும் கொண்டு ஸ்ரீவிதுரரை ப்ரஹ்மமேதத்தாலே ஸம்ஸ்கரித்தார்) - Per the instructions from the divine voice and understanding the most knowledgable nature of srIvidhura, yudhishtra (who was perfectly situated in varNAsrama dharmam) performed the last rites for him (even though he was born to a servant-maid). sUthram 231 - rushigaL dharmavyAdhan vAsalilE thuvaNdu dharmasandhEhangaLai samippiththuk koNdArgaL (ருஷிகள் தர்மவ்யாதன் வாசலிலே துவண்டு தர்மஸந்தேஹங்களை சமிப்பித்துக் கொண்டார்கள்) - Learned saints waited at the gates of dharmavyAdhan (who was a butcher) for him to complete his service to his parents and clarified their doubts in dharmam. sUthram 232 - krshNan bhIshma dhrONAdhigaLai vittu srIvidhurar thirumALigaiyilE amudhu seythAn (க்ருஷ்ணன் பீஷ்ம த்ரோணாதிகளை விட்டு ஸ்ரீவிதுரர் திருமாளிகையிலே அமுது செய்தான்) - kaNNan emperumAn ignored bhIshma, dhrONa, dhuryOdhana, etc and happily accepted food from srIvidhura's residence. sUthram 233 - perumAL srIsabari kaiyAlE amudhuseytharuLinAr (பெருமாள் ஸ்ரீஸபரி கையாலே அமுதுசெய்தருளினார்) - srI rAman accepted fruits from srI sabari who is born in a hunter family but most devoted to her AchAryan. sUthram 234 - mARanEri nambi vishayamAga periyanambi udaiyavarkkaruLichcheytha vArthaiyai smarippathu (மாறனேரி நம்பி விஷயமாக பெரியநம்பி உடையவர்க்கருளிச்செய்த வார்தையை ஸ்மரிப்பது ) - Remember the explanation given by periya nambi to srI rAmAnuja after performing the final rites for mARanEri nambi (saying that its a srIvaishNava's responsibilty to serve personally another srIvaishNava in need citing many examples). Oh yathIndhra (king of yathis - srI rAmAnuja)! Let your sweet mercy destroy my desire for sensual pleasures and develop my affection to become the last servant in the hierarchy of servants of you. Simple transation: We are servants of vishNu and you are brAhmaNas merely following varNAsrama dharma. We are in the mode of servitude so we have not reason to mix with you. aruLALa perumAL emperumAnAr mercifully establishes the same principle in his gyAna sAram through the following pAsruams. He clearly explains that simply holding on to varNAsrama dharmam is of no use and says that for every one, srIman nArAyaNan's lotus feet is the ultimate goal. Simple translation: What is the use of distinguishing a person based on their varNam which is based on the body that is made of the five elements? For everyone, srIman nArAyaNan's lotus feet are the only refuge. Simple translation: Just like the name, color, form, etc of rivers disappear when they reach the ocean, the native village, the family lineage, etc of a devotee of srIman nArAyaNan will disappear and he will be simply identified by his attachment towards the lotus feet of bhagavAn. Simple translation: What is the use of distinguishing a person based on their varNam after having understood the difference between body and soul? For everyone, srIman nArAyaNan's lotus feet are the only refuge. Simple translation: A pure devotee of vishNu is not identified by his native village, family lineage, etc. For such bhaktha, bhagavAn himself is everything. Simple translation: Oh residents of this world! You are craving for material wealth and lust; we are craving for service to srIman nArAyaNan. 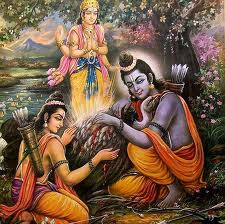 As you are servants of your senses and we are servants of srIman nArAyaNa, there is no reason for us to mix together. He also declares that his true identify is based on his AthmA and not his varNam or Asramam. Simple translation: I am not a brAhmaNa, not kshathriya, not a vaisya and not a sUdhra. I am not a brahmachAri, not a gruhastha, not a vAnaprastha and not a sannyAsi. I am a servant of the servant of srI narasimha who is the husband of srI mahAlakshmi. suka brahmarishi say "My identity is not based on varNAsrama dharmam. Nor it is based on the jIvAthmA which is identified based on knowledge and bliss. But it is purely based on my servitude towards the devotees of srI lakshmi narasimhan. After having such understanding, we can see that there are only 2 types of people - bhAgavathas (devotees) and abhAgavathas (non-devotees) - there can be no other classification". Thus he serves his ties with all materialistic people and simply associated with the devotees of srI lakshmI narasimhan emperumAn. This charithram (incident) is well-known and popular. 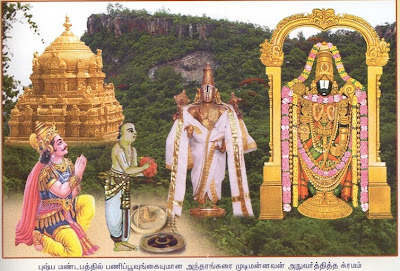 Simple translation: Those who have five type of weapons (inherited from bhagavAn - sankam, chakram, etc), who have undergone panchasamskAram, who are fully situated in AchArya nishtai and are practising panchakAla parAyaNam (day divided into five parts abhigamanam/waking up, upAdhAnam/collecting materials for thiruvArAdhanam, ijjA/thiruvArAdhanam, svAdhyAnam/study from sAsthram, and yOgam/meditation on bhagavAn - for serving emperumAn) - they are called vishNu bhakthas irrespective of their varNam and Asramam. Simple translation: One who is completely surrendered to srIman nArAyaNan who is the guru for the whole universe, is not indebted to rishis, dhEvathas, worldly men, forefathers or anyone. That is why, AzhwAn said "na chEth rAmAnujEth yEshA chathurA chathuraksharI; kAmavasthAm prapadhyanthE janthavO hantha mAdhrusa:" (ந சேத் ராமாநுஜேத் யேஷா சதுரா சதுரக்ஷரீ; காமவஸ்தாம் ப்ரபத்யந்தே ஜந்தவோ ஹந்த மாத்ருச:) where he clearly distinguishes the terms "nArAyaNa" and "rAmAnuja" - where nArAyaNa is common for both bandham and mOksham but rAmAnuja is only focussed on mOksham. That is why rAmAnuja has the special adjective "chathurA chathuraksharI" (சதுரா சதுரக்ஷரீ) meaning "the most prudent four lettered word". Translator's note: Thus, we have seen the divine glories of srIvaishNavas irrespective of their birth. Swamin it is a wonderful article. So nicely written and enlightening. You havbe mentioned this verse "nAham vipro at the end". From which scripture the verse is coming also the verse yuyam yuyam vayam vayam where it appears in the scripture? The exact source is not known - but they are likely purANa SlOkams. Swami thanks for your reply . In which work this slokam is quoted by Sri Vaishnava acharyas? It is quoted in this grantham which we are seeing here (anthimOpAya nishtai). Also, it is quoted in gyAna sAram (whicih is available in http://divyaprabandham.koyil.org.